In a world of chaos, uncertainty, and malaise, it seems we can no longer depend on the institutions that supposedly offered us security and hope. With increasing anxiety and a sickening fear of the future, can we reverse the downward spiral of turmoil and frustration? Is there a way out of the madness? 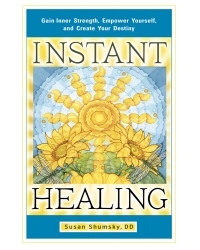 Instant Healing: Gain Inner Strength, Empower Yourself, and Create Your Destiny provides a powerfully positive answer. It can help anyone find instantaneous transformation. By using simple prayers and affirmations, we can experience immediate healing, comfort, and solace. We can gain self-empowerment, inner strength, and wellness beyond our dreams. along with instructions on how to use them. These methods are simple and effective, and require no background or training. Just read the formula out loud, let go, and allow the words to work. The fieldproven, non-denominational, universal methods of spiritual healing in this book have changed the lives of millions of people worldwide. The power of your spoken word can produce miracles! Dr. Susan Shumsky is the award-winning author of seven books—Ascension, How to Hear the Voice of God, Exploring Meditation, Exploring Auras, Exploring Chakras, Divine Revelation, and Miracle Prayer. She is a foremost spirituality expert, pioneer in the consciousness field, and highly acclaimed speaker. Shumsky has practiced spiritual disciplines for 45 years with enlightened masters in secluded areas, including the Himalayas and the Alps. For 22 years, her mentor was Maharishi Mahesh Yogi, guru of the Beatles and Deepak Chopra. She served on the Maharishi’s personal staff for seven years. She is the founder of Divine Revelation®, a technology for contacting the divine presence, hearing and testing the inner voice, and receiving clear divine guidance.